Investors seeking high potential returns will appreciate the scenario setting up surrounding dynaCERT Inc. (TSX-V:DYA) Carbon Emission Reduction Technology. NEW YORK, NY, UNITED STATES, April 2, 2019 /EINPresswire.com/ -- Having developed next-generation Carbon Emission Reduction Technology for diesel engines that also provides significant fuel savings to the operator, dynaCERT Inc. (TSX-V: DYA) (OTC: DYFSF) (Frankfurt: DMJ) with their recent confluence of activity, is positioning its tech toward large-scale adoption globally. Below is a synopsis of dynaCERT’s HydraGENTM (HG) technology, recent accomplishments, news, and imminent expected catalysts. dynaCERT’s HG technology is the Gold Medal winner of the prestigious 2018 Edison Award for Best New Product, it also won Top Prize at the 2019 Mining Cleantech Challenge. Recent testing of HG1 units for diesel transport trucks: High-level validation testing of HG technology in Germany yielded proven emission reductions in NOx of 88%, reductions in CO of 50%, and reductions in particulate matter of 75%, all while saving up to 20% on fuel costs – these results are unmatched by any other current technology. NOx is extremely hazardous to people's health and to the environment, contributing to the formation of smog and acid rain, as well as deteriorating the earth's protective tropospheric ozone. dynaCERT has also received validation from PIT Group in North America, and notification of certification for India and South Asia markets from the International Centre for Automotive Technology. Technology that pays for itself (operators save up to 20% on fuel costs): Recent TUV and homologation testing revealed that while the dynamometer test showed a 8.9% fuel savings, separately, during the on-road break-in period after the baseline test, the on-board diagnostic (OBD) record of the 2018 MAN TGX 18-460 long haul truck with an HG1-45B showed a 20.1% average fuel savings for the 188 hours of tests, travelling through the mountainous terrain of southern Germany in a heavy load commercial operation. Noteworthy trials that could translate into a major snowball effect in orders: Government of India is moving forward on sizable initial orders from two of twenty nine government states. The government of Austria is proceeding with a plan to equip all state-owned diesel-powered vehicles with HydraGENTM Technology. The mining industry is now entertaining orders to service extra-large industrial equipment. Noteworthy appointments and dynaCERT at the fore of coming carbon credit market(s): This March-2019 dynaCERT announced that it has initiated the world-wide process of Carbon Credit applications for its HG technology and engaged International Environmental Partners Limited of the UK, a carbon credit advisory and trading house with global outreach. 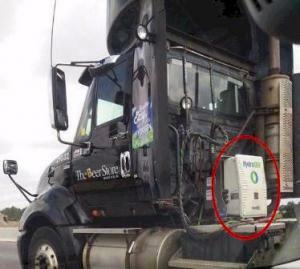 dynaCERT’s Smart-ECU (the brains of the unit) interfaces the trucks engine to determine the proper flow rate of gases to optimize the burn, it also records the fuel savings and emission reductions while in operation, providing an audit trail, essentially a greenhouse gas tracking system with the ability to account for future carbon credits. dynaCERT has several related worldwide patents. Additionally, the appointment of FinTech Pioneer Brian Semkiw to dynaCERT’s Advisory Board will be helpful if digital blockchain tokenization is proposed as part of the audit and exchange solution. Other noteworthy individuals associating themselves with dynaCERT in an Advisory and/or Directorship position: 1) David Bridge, one of the original developers from Virgin Mobile, and also formerly of Research in Motion (known for the Blackberry), 2) R. Wayne Hoffman, the former President of Cummins Diesel Canada. 3) Mr. Frank Klees, a Progressive Conservative Member of the Legislative Assembly of Ontario from 1995 to 2014 where he held numerous important positions including Minister of Transportation, Minister of Tourism, Chief Government Whip, Deputy House Leader. The list of high caliber individuals associating themselves with dynaCERT is extensive – see the Company’s website for a complete listing. dynaCERT’s HG1 product line is being well received and the Company is seeing repeat business from many satisfied clients expanding use of the technology in their fleets. dynaCERT is also continually active growing awareness; here is a sampling of recent/upcoming trade shows it has presentation space at: March 28 to March 30: Mid-America Trucking Show, Louisville, Kentucky, April 1 to April 5: Hannover Messe, Germany, April 11 to April 13: Montreal ExpoCam Show, Canada, April 8 to April 14: bauma in Munich, Germany. 1) Official European ABE (ABE is a German acronym for ‘official notice of approval’) certification licensing for dynaCERT’s HG technology is expected to occur imminently. ABE will allow the HG technology to be sold into Europe, where dynaCERT has already primed the markets. 2) HG2 launch imminent: dynaCERT has developed a smaller HG unit (the HG2) for refrigerated trailers and containers (a.k.a. refers). The HG2 is something dynaCERT was requested to develop by a major grocer in Canada. dynaCERT is expected to launch the HG2 in Q2-2019, and the size of the refer unit market in North America is three times larger than the transportation truck market. In the future dynaCERT is looking at expanding HG technology to shipping and rail, plus its product is scalable.